MCA Nashville’s George Strait celebrated the newly-minted Platinum status of his recent single, “Give It All We Got Tonight,” at his The Cowboy Rides Away Tour rehearsal in Nashville on Friday (March 21). 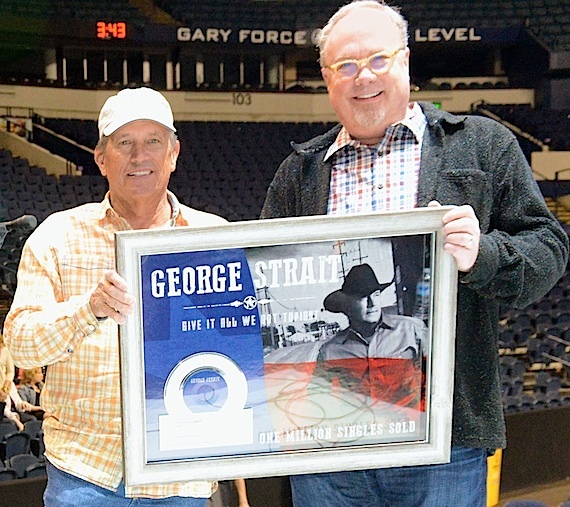 Prior to Strait’s sold-out Bridgestone Arena show, UMG Nashville Chairman & CEO Mike Dungan presented him with a plaque to celebrate one million digital singles sold of “Give It All We Got Tonight,” off his album, Love Is Everything. For more information on Strait’s Nashville concert, read MusicRow‘s review of Strait’s The Cowboy Rides Away Tour visit. Pictured (L-R): MCA Nashville recording artist George Strait, UMG Nashville’s Mike Dungan.